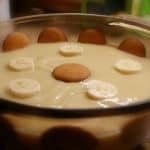 Old Fashioned Banana Pudding is one of my family’s most favorite deserts. This is an OLD family recipe. My Grandmother taught my Mother how to make Old Fashioned Banana Pudding, and my Mother taught me how to make it. As far as I know, the recipe was not written down until I was a teenager. My Mother used to tell me to put a handful of flour, and this much sugar, etc. I finally got tired of that, and decided to measure everything she put into the pudding and write down the recipe for old fashioned banana pudding. Have to tell you, I got pretty frustrated trying to get all her recipes in writing! 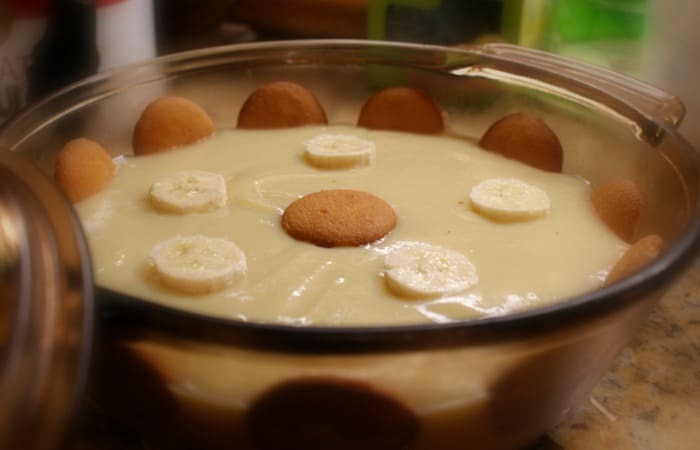 Glad I did though…you’re gonna love this recipe for old fashioned banana pudding from scratch just as much as my family and I do. The pudding is creamy and sweet, and will satisfy your sweet tooth like no other. Now, let’s get busy and put together the best old fashioned banana pudding on the face of the planet! My Grandmother taught my Mother how to make Old Fashioned Banana Pudding, and my Mother taught me how to make it. As far as I know, the recipe was not written down until I was a teenager. My Mother used to tell me to put a handful of flour, and this much sugar, etc. I finally got tired of that, and decided to measure everything she put into the recipe and write it all down. Put water into the lower half of your double boiler over high heat. (If you don’t have a double boiler, you can use a large pan–like a dutch oven–for the bottom and a medium-sized sauce pan for the top.) After the water comes to a boil, reduce heat to medium. Place top half of double boiler on top of the bottom half, and pour 2 cups milk into the top half of the pan, to scald. Bring the milk to 180ºF. While the milk is heating, separate the 3 eggs. Discard the egg whites. Put the egg yolks into a medium-size mixing bowl and beat until light. Sift together the flour and sugar and mix well. When the milk has reached temperature, add 1/2 cup of the hot milk to the beaten eggs. This is to “temper” the eggs and prevent them from scrambling when they are added to the hot milk. Slowly pour the egg/milk mixture into the flour/sugar mixture. Stir to combine and break up any lumps. Add the vanilla, and stir until the mixture is smooth and creamy. Carefully and slowly pour the egg/milk/sugar/flour mixture into the hot milk, stirring constantly. Continue to stir occasionally, until mixture begins to thicken, then stir constantly until the pudding has reached the desired consistency (about like pancake batter). Using a covered casserole dish, begin by spooning a layer of the pudding into the bottom of the bowl. Add a layer of vanilla wafers. Cut the banana in to disc shapes and add a layer of banana chips. Continue making layers, ending with a layer of pudding. Put some of the vanilla wafers standing up around the edge of the bowl. Push the cookies about halfway into the pudding. When I was a kid, my mom made this recipe to serve 2 adults and 4 children. Whenever I make this recipe, I double it to serve 4 people. Of course, I like to have some leftovers! Hope you enjoy this recipe from my family. Please like NerdyMamma on Facebook.